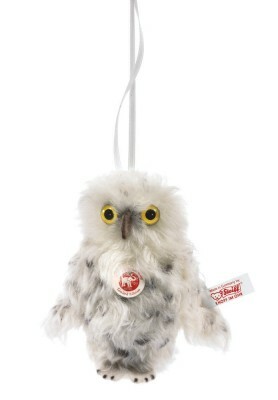 This little owl is the eyes and ears of the Enchanted Forest. He keeps watch by night to make sure everyone is safe and sound. This Steiff creation is also a masterpiece in miniature. To simulate feathers, we chose a wavy mohair and then painted accent spots all over his body. He features a felt beak and feet. His luminous yellow eyes are surrounded by long mohair. The backs of his wings are sewn from soft boa, creating an interesting contrast of materials.